We are going scuba diving in Padang Bai tomorrow and apart from the great dive sites, it’s my favourite trip as we get to eat at Topi Inn, yummy Nasi Campur! 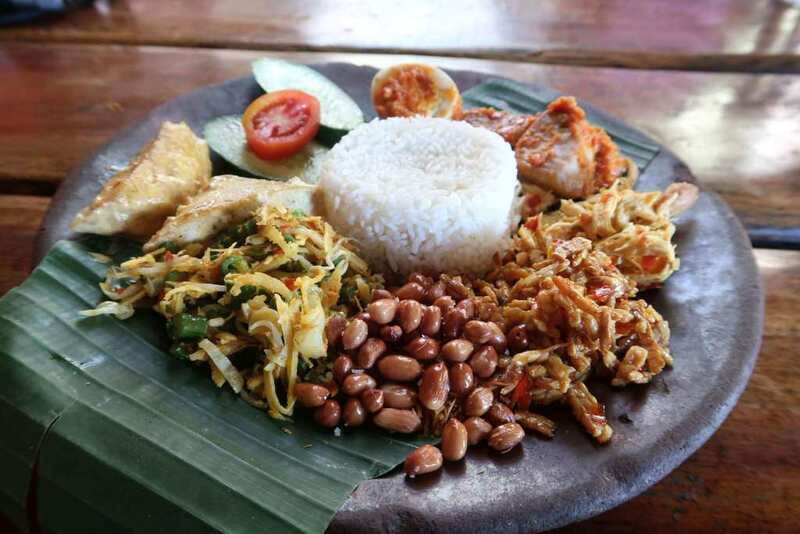 If you are wondering what Nasi Campur is, then here is a description of the most popular dishes of Indonesian cuisine you can try here in Bali. Nasi Goreng is one of the, if not the most, popular meals of Indonesian cusine. Nasi means “rice” and Goreng means “fried”, so it’s literally fried rice seasoned with spices, like sweet soy sauce (which gives it its brownish colour), chilli pepper, vegetable oil, powdered terasi (shrimp paste), ginger garlic paste, shallots, turmeric, spring onions, nutmeg, onions, palm sugar, salt, garlic. It is generally served with Krupuk (Indonesian crackers), cucumber, tomatoes and egg (in omelette style or sunny side up). Pisang Goreng means “Fried Banana” and is a most known sweet snack here in Indonesia. It’s banana, covered in batter, fried in hot cooking oil. Sometimes it’s served with chocolate sauce, other times sprinkled with cheese, which is a bit weird to the western palette. Nasi Campur is pronounced Nasee Champur, which means “Mixed rice” and what accompanies the rice changes depending the place you go. The one on the picture contains: mixed vegetables with coconut, peanuts, egg, tempe manis (sweet tofu), fish with sambal (a spicy sauce widely used in indonesia), shredded chicken, curry tofu, krupuk, cucumber and tomatoes. This is what i’m looking forward to today after diving in Padang Bai. Sate Ayam is really popular in Bali. It consists on pieces of chicken put on skewers, marinated in a soy and peanut sauce and grilled. You can find it in lot of places, especially on the streets, people grill Sate Ayam sticks on a little barbecue. For these typical meals, the best and cheapest way to enjoy them is in little street restaurants called Warungs that you can find really everywhere on the streets. The food is home-made and you can enjoy amazing typical food in a welcoming simple place. Thank you to Mélissa who send us this blog on the best of Indonesian cuisine. If you want to join us to our Diving Day trip to Padang Bai and enjoy some tasty food, click here.